The new Colectivo Coffee replaces an Einstein Bros. Bagels restaurant at 2530 N. Clark St., with a patio in place of the former parking lot. LINCOLN PARK — Parking comes at a premium in Lincoln Park, but a new coffee outlet is trying the gambit of turning a parking lot into a grand patio. Colectivo Coffee opens Monday in the old Einstein Bros. Bagels at 2530 N. Clark St. 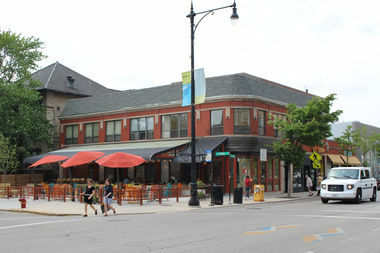 Since the Milwaukee-based company first announced it was coming to Chicago almost a year ago, the parking lot on the site — a rarity for Lincoln Park merchants — has been converted into a grand patio with permanent steel umbrella fixtures and homey, roughened tables and chairs designed to give it a comfortable, welcoming feel. This being Chicago, it also has a fire pit, and heaters installed under the awning. "It's really transformative," said Colectivo spokesman Cody Kinart, who called the patio "a fun spot for the neighborhood." With its Troubador Bakery brand, Colectivo sells about as much food as coffee. That it figures to be, but how the store ultimately fares depends on the coffee and food, especially as it's landed right across the street from a Starbucks and Cafe Vienna, 2523 N. Clark St., which generally keeps weekend hours. Kinart said that casts Colectivo's strengths in relief, as since 1993 it has specialized in dealing with individual coffee farmers and small collectives in Central America, Africa, Asia and everywhere in between. Colectivo then roasts by hand — or what it calls "session roasting" — to customize what's best for each coffee type, not the uniformly hard and distinctive roast of a Starbucks. Some but not all of the coffee is "fair-trade organic," but Kinart said Colectivo doesn't get hung up on whether the coffee meets all the specifications that go with that label. "We really just source the best coffee we can find," he said. 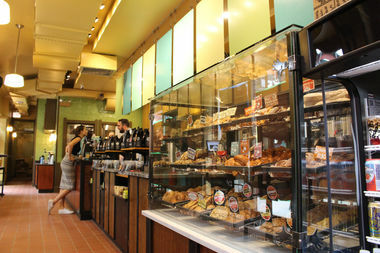 Through the years, Colectivo has also developed its own Troubador Bakery brand, and all the coffee and baked goods are shipped in daily from the Milwaukee area. Kinart said Colectivo tends to sell as much food as it does coffee. The coffee shop opens at 6 a.m. Monday and every day after that, staying open until 10 p.m. weekdays, 11 p.m. on the weekends. The late hours are in part because it also has its own Colectivo Keg Co. house beer, made from recipes developed by employees, with three taps to start and a fourth to come after Colectivo applied for a liquor license at the location to go with the outdoor patio earlier this year. The patio is dog-friendly in a neighborhood where everyone always seems to be walking a dog, and it has Wi-Fi as well. Colectivo has 13 outlets in Milwaukee and another three in Madison, Wis. This is its first in Chicago, but according to Kinart it has signed a lease for a Logan Square location with a tentative opening set for "October-ish."